As part of the creation of a new high-speed rail network, the Italian Government has instituted a major programme of station restructuring, including the creation of many new stations. 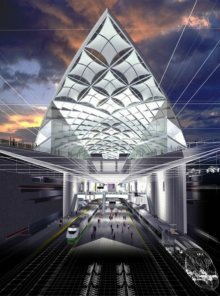 The design for Florence Station by Sir Norman Foster and Partners provides a new facility that will connect with the citys existing Santa Maria Novella station via a new tramline. The roof collects a massive amount of drainage water. We were comissioned to perform a rain flow simulation. Several characteristic regions of the open water channels were discretized. The governing Navier-Stokes equations were solved under consideration of the open channel hydraulics. Figure 1: Florence TAV Station. 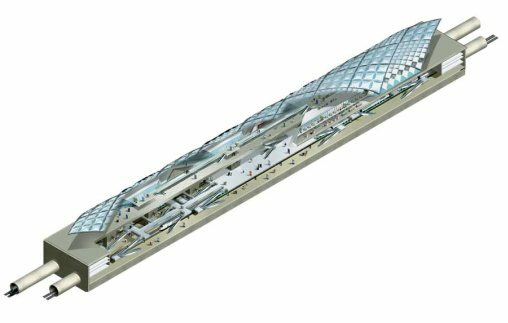 Figure 2: Schematic view of the station. 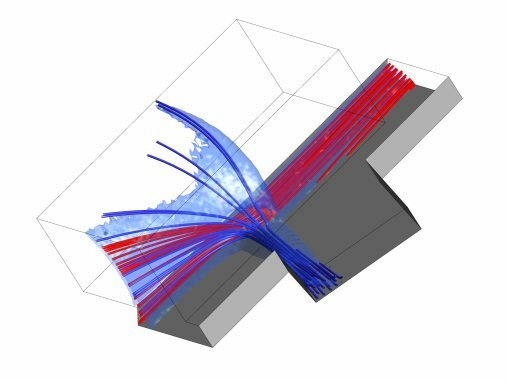 The CFD simulation allowed to obtain detailed information about the hydraulic performance of the various junctions under varying weather conditions (see Fig. 3). Since the drainage system consists of two layers (one open channel and one closed channel), various degrees of blockage of the lower channel were studied. Figure 3: Open channel flow at a typical T-junction of the roof.